Red Phase Instruments have developed a range of KWh meter test units for both Single and Poly-Phase meters, with in-built phantom load ability. The Model 471 is a fully digital kWh meter tester, with an in built 30 Amp phantom load ability. A digital signal processor performs all of the energy calculations and measurements and a separate processor board facilitates parameter entry and results display. The currents can be injected at Power Factors of: 1.0, 0.86 lag or 0.5 lag, selectable on the LCD screen. 220V-270V. 0.5A-30A. 1.0PF to 0.86PF lag. 48Hz to 52Hz, or 58Hz to 62Hz. Energy measurement accuracy is 0.075% over the above ranges at 0.86PF lag to 0.5PF lag. The voltage and current measurement as shown on the LCD screen is accurate to 1%. Phase angle to 1 deg. Unit size is 400mm wide X 340mm deep X 200mm high, and weight 10kg. Recommended operating temperature range is 0deg C to 40deg C.
Up to 500 Meter test records can be stored. Records can be downloaded to a PC using the USB port on the front panel. errors to 0.03% or 0.1% accuracy. The Model 689B has a 3 phase switch mode current source. done using the multi pin “CURRENT” socket on the front panel. downloading to a USB flash drive. rough handling in the field. There is a carry handle on top and both ends of the case. The Model 691 is a moderately priced 3 phase reference standard. 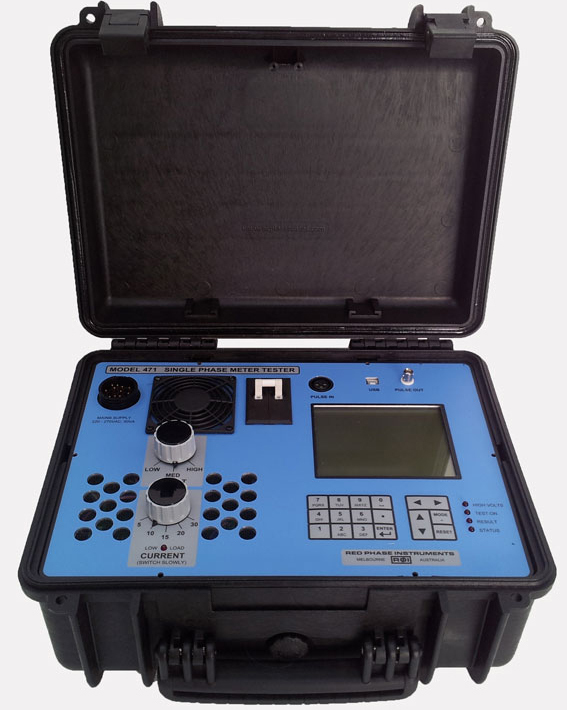 It is packaged in a 19” style bench-top case with all connections on the front panel for use in meter test benches. The software enables meter testing with all the common type of real and reactive kWh meters, both disc and electronic types. The LCD readout shows all the parameters in the test circuit as well as meter test results.